1417WGC/WCC is a great DR solution for both fixed and portable applications. The 1417WGC/WCC detectors are ideal for in-room and portable applications by providing increased workflow efficiency in the X-ray room and beyond. Its durable carbon-fiber, seamless unibody construction combined with a shock, vibration and scratch resistant composition makes it well-suited for the most demanding imaging environments. An Access Point (AP) enables images to be directly sent to a Wi-Fi connected computer within seconds and a built-in memory storage permits taking images where a computer connection is not available as well as prevent lost images should there be an interruption of power. These are among many features that make the 1417WGC/WCC the ideal flat panel detector solution for both fixed and portable applications. 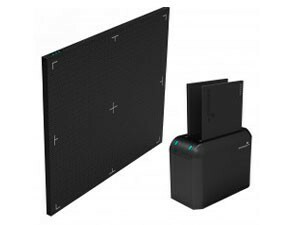 Rayence flat panel detectors provide the highest image quality and reliability available in today’s market. This is achieved through years of research and development and a history of pairing stringent manufacturing quality control standards with superior components. The outcome revolutionized the flat panel detector industry and allows us to offer a premier product without compromise.